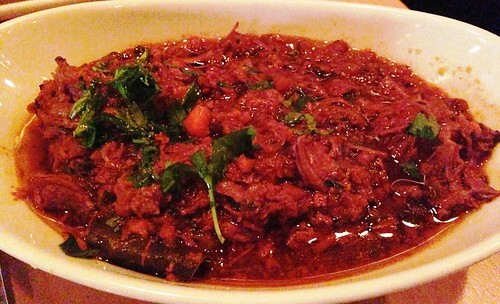 Ghibellina: Solid Food, but Worth the Hype? Admittedly it has taken me a while to get to Ghibellina, ok, a long while. This fact may seem odd given that it’s within three blocks of where I live. However I must confess…it was on purpose. I love Italian food. My mother’s side of the family is all Italian (Bruncati and Bonanno), and I was raised on authentic Italian cuisine. So when the owners of Ghibellina opened their first DC alleged “hot-spot” in Eastern Market, Acqua Al 2, I was very excited. That excitement soon diminished after I went there. The service, rude. The food, mediocre at best. With that said, and no offense to Eastern Market, I was very excited when they were opening Ghibellina on 14th Street. Arguably the hottest new restaurant real estate market in DC (certainly the most expensive), I took this as a sign they were stepping up their game, and finally there would be good Italian on 14th. The restaurant and bar area can only be described as gorgeous. Meticulous in detail, from the rustic light fixtures, to the large bar, and open front windows with bar counter; the space was expertly crafted and finished. Lines poured out the door for weeks, then months, and the steady state seemed to continue. Giving the a solid time period to work out their kinks, I recently, and finally, stopped in for dinner. Not once, but twice in the past 10 days. First, the service. Robert, the GM, is a wonderful person. Kind, very knowledgable about their wine selections, patiently walking me through several choices, offering tastings and following up; truly a great sommelier (regardless if he holds the formal title or not). While the very tall, and very pretty front of the house hostess was a bit rude, the table service was exceptional. Water glasses never made it to the half way point, we occupied a two-top for hours without feeling rushed or hurried, even as a wait formed at the door. And on a separate visit, the bar staff (I’d guess, mid-twenties, female) was funny, sassy in the perfect way, and attentive. However, when it came to the food, the overall theme was, lacking. Now I know plenty of people whose opinions on food I respect who love this place. Who think Ghibellina can do no wrong. I’m not a “food critic” and I don’t have formal training, but I’ve spent my entire life cooking with Italians, and harvesting, cleaning, and preparing my own proteins with Southerners, so take my thoughts with a grain of salt if you will. The best thing on the menu we found was the Pappardelle Ai Funghi Misti. This dish needed nothing other than more of it. The small or half portion is enough to split with someone if you are ordering multiple dishes. However if this is what you are there for, and you should be, order the large portion (and then another to take home). 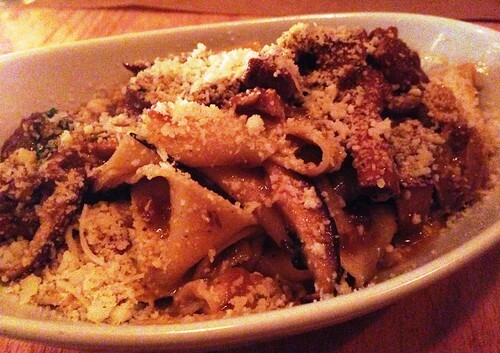 Housemade long and flat pappardelle noodles are laced with a succulent, perfectly cooked trio of porcini, chanterelle, and shiitake mushrooms. To add a salty and texturally contrasting component to the dish, and rightfully so, Ghibellina adds house-cured guanciale – which is basically bacon made from pig cheeks that is typically not smoked but cured. Tying the dish together is a generous dusting of grated pecorino cheese. Warm, comforting, soothing, salty, and satisfying. I will return for this, and a bottle of wine monthly I can promise you. And the wine will be a Terrazze Tenuta Mazzolino Pinot Nero. Another dish that was enjoyed, although was missing something, was the Stracotto. Essentially this was a large bowl of very tender braised roast beef with tomatoes in a white wine jus. A bowl of roast beef. Already it’s good just being what it is. And it was good, especially when scooped up with the warm bread provided. But there was nothing to cut the richness of the roast beef. Perhaps something creamy; shredded parmesan or a cream sauce drizzled on top. Or maybe citrus; orange zest may work well here. Again, it just seemed to miss something to bring such a simple dish to the level worthy of an hour wait on 14th Street with a million other options. 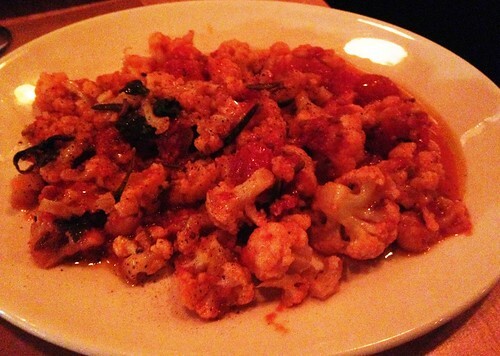 The roasted cauliflower we ordered was not roasted, therefore very disappointing. When I think of roasted cauliflower I think typically oven roasted, with a nice crust or char, bringing out a nutty flavor. These tasted partially boiled or steamed, then tossed with pine nuts, olive oil, and tomatoes. Not terrible if that’s what you are looking for, but I would steer clear from the “roasted” descriptor. Onto the pizza. If you ask a handful of people who have elevated their pizza tastes past delivery, you’ll find that at least half will likely list Two Amy’s as one of their top pizza places in DC. 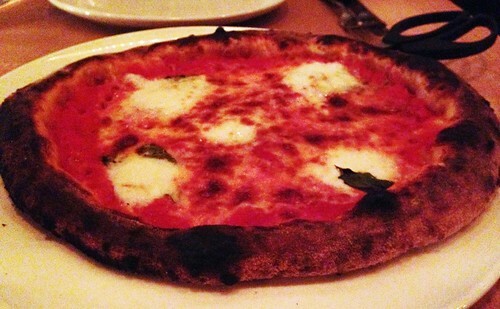 Their pizza, similar to Ghibellina, is Neapolitan style, which I prefer. I’ve had both the classic Margherita di Bufala pizza which is traditionally simply with tomato, basil, and buffalo mozzarella (pictured), and the Salsicce e Cipolla which was sausage, provolone, wood-roasted onions, oregano, peperoncino and grana. The pizza, while good, I personally found a bit soggy the first time I ordered. The crust was perfectly blistered, however the bottom of the pizza was not crispy or firm, and did not hold up well to the water/liquid produced from the toppings once cooked. When I went the second time and ordered the pizza cooked more on the bottom, it was noticeably improved. I’ll happily split a pizza the next time I’m there with friends, if they suggest it, and I will do so without protest. However for my 14th Street pizza needs, I’ll head across the street to the Two Amy’s co-owned Etto. I found the pizza at Ghibbelina to be perfectly crisped while Etto’s was soggy. Would return to Ghibbelina for the pizza but didn’t love much else. Sounds like your experience was just the opposite.